Dr. Mehmet Salih Bayraktutan PhD in 1987, along with Dr. Ekrem Akurgalem (now deceased) worked for the Turkish government, together with R. Wyatt, and research on the discovery of Noah's ark. The Turkish government has confirmed the age-old research of Ron Wyatt and his colleagues. Based on this new nature reserve place of Noah's Ark on 20 June 1987. Mr. Milan Substance (www.b-a-n.cz) made contact with Dr. Mehmet Salih Bayraktutanem PhD from Turkey, who is president of EAGE (European Association of Engineers and geoscientists - Turkish branch), it is also a founding member of IASGT - Association of Structural Geology & Tectonics. 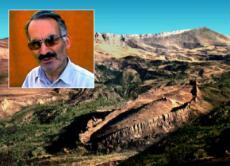 Is a member of the AAPG (American Association of Petroleum Geologists) - for geology in Turkey. Currently holds many other important functions, such as geological advisor for seismic hazards and risks for oil and gas pipelines in Turkey. You have the unique opportunity to attend workshops in person with someone who has personally been in research of Noah's Ark for the Turkish government.